A railfan favorite, the BNSF Railway is one of Americas largest railroads with a rich heritage: ATSF, CB&Q, GN, NP and others. 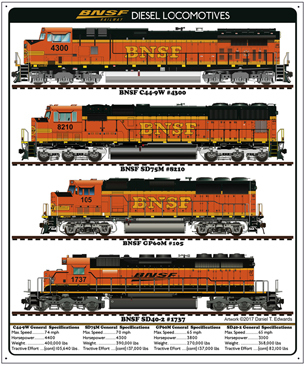 Individual marks are licensed marks owned by BNSF Railway Company. 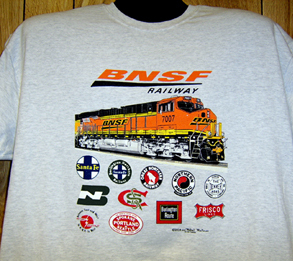 The BNSF Railway mark is a licensed mark owned by BNSF Ralway Company. All marks are used with permission under an active license agreement. 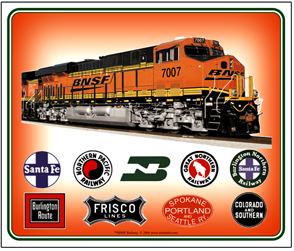 Burlington Northern Santa Fe Railways latest color scheme with historic logos of railroads that make up todays BNSF Railway. 6 inch x 6 inch square tin logo sign of the Burlington Northern Santa Fe Railway, the swoosh logo. BNSF Railroads latest design is beautifully presented on this white 11 oz coffee mug. On the reverse are 9 logos of predecessor railroads that make up todays BNSF. A great, colorful and informative coffee mug everyone will appreciate. 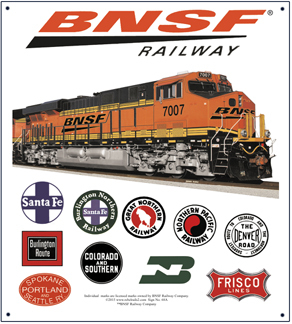 A collage of the BNSF Railways historic railroad logos along with a diesel with its latest color scheme. Unique sign featuring diesels used by the BNSF Railway over the years. Another great sign by Daniel Edwards.